The observant amongst you may have noticed a new feature on this website’s front page, The Lakeland 365. This is a new project which I have rencently embarked upon. This is no way as big or intense as The Wainwrights in Colour but it does have some connection. 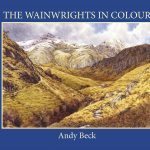 This is a list of all of the Lakeland Fells which Wainwright either wrote about in his guidebooks or just considered when he was putting together his ideas for the Pictorial Guides. The project will detail all of these fells in either sketches, photographs, walks and films. It will take some time to upload all of the fells especially as I have yet to visit some of them but that will not be much of a chore. Do take time to have a look at the new Lakeland 365 website and if it is something that you are interested in then do subscribe to that site. I try to upload at least one fell a day and by subscribing you will get updates through your email system. Do let me know what you think of the new project and website. It is work in progress and I am happy to take on board suggestions to improve the idea.